I've been playing with two RS5 robots, it is possible to do some cool stuff. I've implemented object tracking using color and this way is possible for one robot to follow the other one. 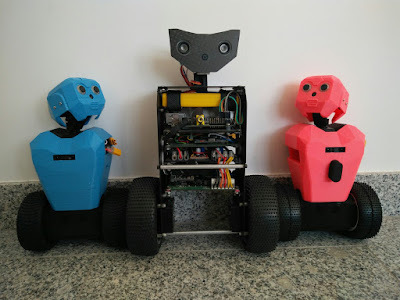 Take a look at the video, the blue robot is remote controlled and the pink robot is autonomous. Color tracking can be tricky due to changing light conditions. If the ambient light is stable it works really nice. I still have my RS4 robot and it is fully functional. You can see in the picture the size difference between them, they have the same capabilities. I managed to better integrate all the components in the newer robot.